The winner receives a blog devoted to their name. Although the prize may not be very good, and most people would likely rather not win, it is the prize I decided, and it is the prize that will be given. The 1111th comment, however, will indeed receive an actual prize, if that day ever comes. Jeremy Alan Olson has been my brother for nearly 22 years. He is the one in the photo who isn’t a woman over forty, or a man with his hand on his hips. He is the one flipping you off. He has taught me about good music, tennis and hockey and ping-pong, told me to never smoke cigarettes, and later gave me my first RedMan chewing tobacco, taught me about humility and pride, coached me in football, was my counsellor at camp, and he called me obese for the first twelve years of my life. We were walking in downtown Toronto when I was maybe nine years old, and there was a delivery van with the name ‘Fat Angel Bistro’ on the side. He told me that this must be owned by me, and poked me in the stomach, although he didn’t even know what a bistro was, and had to ask dad. Our relationship has been based on insulting comedy, testicle hits and competition since then. I still regularly beat him in ping pong, crokinole, MarioKart and especially Super Baseball 1.000. The rivalry lives. Big brothers always have the tendency to be assholes, and I likely hated Jeremy up until he left for boarding school in grade eleven, but these days he’s alright. Now, seeing him only a few times a year, I often wish that he didn’t live in Canada’s worst city and lived closer to wherever I am at the moment. He’s got a legitimate job as a science genius and worked hard for it, and I respect this a lot. Good blogs aren’t for feelings or sentimentality, but he’s an alright brother, taught me exactly how to be an alright brother, and is the greatest nearly thirty year-old that I know. 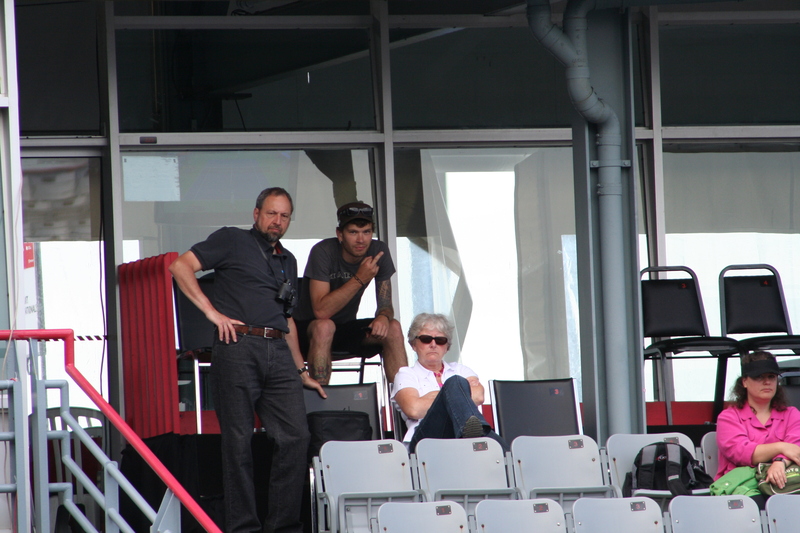 Last summer we came to Montreal to watch Rogers Cup tennis. After a perfect week of food, sports, music and walking, he told me that I should move to Montreal, date this girl, and go to hockey games. So I did. I guess he’s pretty wise after all. Thanks Jerms. If I grow up to be as old as you, I hope to be half as cool, rich, bearded, level-headed and decent as yourself. Here’s to my oldest brother, the 1000th contributor to this fair forum. Feel free to slander the winner via my blog. If the 1111th comment is slander of Jerms, you get a double prize. i think he also said you owned “Mr. Tool” ha. i have some pretty alright brothers. I still think it wasn’t fair that I couldn’t comment on your blog JUST because it could look suspicious.